A few weeks ago, I had a post entitled Formula for Success – planting Fall vegetables, in which I tried to decipher a formula I found online that should help in deciding what crops could still be planted in the fall. Who would think that a math degree is needed for gardening, but it is sometimes true. Let's look at the components of your equation, with a small modification. If we plant in the "normal" spring growing season, we can plant seed of a tender crop at the spring frost date. That takes into account a safety factor for a slightly later freeze when a tender plant is germinating and still protected under the soil surface. (Of course, a tender-crop transplant needs planning for some type of freeze protection since it does not have the protective soil cover.) We estimate the first harvest from that crop with the number printed on the seed label. For example, a "65 day" crop needs about 65 days from seeding to first harvest, after which we have a short or long productive time, or harvest period, depending on the crop, management, etc. All of this is based on warming, longer days of spring into summer. Shifting this to a fall harvest time, we need to think instead about how the crop responds as the days are getting shorter and cooler. This is the fall factor. Thus, a 65-day crop from seeding could need closer to 80 days (although germination will likely be faster since the soil is warm at seeding). That is the fall factor in your equation getting us to the first expected harvest time. How long that harvest continues depends on the crop involved. Something like bush beans we could look at for a single, once-over harvest, but your preference could as well be for multiple harvests over a two-week period. Thus, the average harvest period will vary with every crop (and gardener). When we bring the frost factor into the picture, it helps us understand when cool-season crops (half-hardy and hardy) are better choices for the fall garden because a) they generally thrive under the cooler temperatures (with shorter days) and b) the frost factor is less a worry. Thanks so much for the detailed explanation, Dr. McDaniel. I enjoyed our conversation. Shhhh. Do you hear that? It is the collective sigh of relief in the wake of hurricane Irene. Or haven't you let out your sigh of relief yet? I think it’s okay now. Go ahead and breathe. And now, comes the clean up. And the lessons learned. One of the first things that I always seem to notice after something like this is what I learn about people. I think that any sort of emergency or disaster either brings out the kindness or the cruelness of people. There are those who reach out to their friends and neighbors, checking in, seeing if they need anything. And there are those who shove ahead of others in the crowded department store lines or loot the homes of people who evacuated their homes. With all of the stress of hurricane preparations and recovery, it's a little disheartening to learn about the negative side of people. So just ignore it. Move on. The other lessons, of course, are the ones that are learned from Mother Nature. As of this writing, there are at least 19 deaths attributed to hurricane Irene. At least 11 of those deaths were caused by fallen branches or trees. Millions of people were without electricity during the storms. Again, many of the power outages were caused by fallen trees. I am a self-professed nature nerd and tree lover, so these statistics about the cruelty of nature bother me as much as the reality of the cruelty of people. But these thoughts are not quite as easy to ignore. I can do my best to avoid unpleasant people, but my soul would suffer if I thought I had to be fearful of trees. Thankfully, there has been a lot of research done on hurricanes and trees, conducted by the experts who have experienced much of it first hand, researchers at the University of Florida IFAS Extension. Since 1992, they have been studying the kinds of trees that were more apt to break or topple over during hurricanes, as well as the reasons why. True, some of what they learned was about treess that don’t grow in the northeast. But as with most things in nature (human nature and mother nature) many of the lessons that life provides are not geographically specific. If you lost trees or lost power, or are just interested in learning a little bit more about trees and hurricanes, the University of Florida has created an entire website devoted to Trees and Hurricanes. For example, some of the trees that were found to be MOST wind-resistant in their studies include: American holly, inkberry and bald cypress. Some of the trees that were the least wind-resistant were: tulip poplar, southern red oak and water oak. Trees growing in confined soil spaces are prone to blowing over. Root defects such as girdling roots cause trees to blow over. Apparently healthy trees can blow down because supportive roots have decayed or soil becomes soft from saturation. Large and old trees blow over; recently planted trees blow over; well established young to medium-aged trees are less likely to blow over. Construction activities within about 20 feet of the trunk of existing trees can cause the tree to blow over more than a decade later. Trees in shallow soils are more prone to blow over than trees rooted more deeply. Uprooted trees can break underground utility lines such as water and sewer. Trees become unstable in soils saturated by lots of rain. Trees that are preventively pruned are less likely to fail than neglected trees. Trees with one dominant trunk fair better than trees with co-dominant stems. Trees with bark inclusions are prone to falling apart. Large pruning cuts create decay and cracks that can lead to breakage in storms. Trees in a group blow down less frequently than single trees. Tree trunks can be hollow without openings in the lower trunk; these are prone to failure in storms. Trees that have failed before are likely to fail again. So while you are enjoying the relative peace in the wake of the storm, think of the lessons learned. Take care of the people and the trees that you love. And don’t be reluctant to get rid of the ones that may only end up hurting you. Since "green gardeners", with healthy, nutritious soil, often have more earthworms, I wanted to post a question. Have you seen more earthworms than usual crawling around lately? Earthquakes emerging to the surface are supposed to be a tell-tale sign that an earthquake (or a flood) might be on the way. At least, that's what some people think. Dr. Ikeya at Osaka University has been studying earthworms and earthquakes. Ikeya’s laboratory experiments were conducted to see if exposure to an electrical field or electromagnetic pulses could elicit animal behavior similar to what has been reported prior to earthquakes. The results: fish showed panic reactions, and earthworms moved out of the soil and swarmed when current was applied. The Kobe earthquake in 1995. I live 30 km from the epicenter and thought it strange that many earthworms dug themselves up in my small garden. At the time, I did not know the legend that a number of emerging earthworms is a sign of a large earthquake. Many people noticed this, including my neighbors. What about your pets or other critters? There are many theories that animals are more in tune with Mother Nature than humans. It's just something interesting to think about. Rats, weasels, snakes, and centipedes reportedly left their homes and headed for safety several days befor a destructive earthquake. Anectdotal evidence abounds of animals, fish, birds, reptiles, and insects exhibiting strange behavior anywhere from weeks to seconds before an earthquake. However, consistent and reliable behavior prior to seismic events, and a mechanism explaining how it could work, still eludes us. Most, but not all, scientists pursuing this mystery are in China or Japan. So what did you notice? Were your pets or critters acting strange before the quake? WSSC's Fishing Derby - the perfect lesson in WHY you are a "green gardener"
Want a great way to teach your kids WHY they should practice environmentally friendly gardening? Take them fishing! Although I've always been a nature lover and gardener, it wasn't until I met my husband, an avid fisherman, that I learned the direct correlation between how I gardened and the health of local fish. He's the one that taught me that all of those fertilizers and other chemicals I was using in my garden could be finding their way into local water supplies, causing fish deformities and death. So take your kids fishing, and spend a little time letting them know that their eco-friendly gardening practices help keep those fish healthy. The Washington Suburban Sanitary Commission’s annual Family Fishing Derby is Saturday, August 27 at its Triadelphia Recreation Area. This catch-and-release event promises prizes – and plenty of fish tales – for first-timers and fishing veterans alike. Located at 2600 Triadelphia Lake Road in Brookeville, the derby begins at 9 a.m. and the final weigh-in is at noon. Prizes will be awarded for biggest fish and most fish caught – child and adult. A Maryland fishing license is required for anyone 16 and older. The recreation area includes picnic tables and a playground set. Register in person at Brighton Dam Visitor’s Center, 2 Brighton Dam Road, Brookeville, MD, 20833, by phone at 301-206-8240 or by e-mail to: saugust@wsscwater.com. More information is available on the WSSC website, www.wsscwater.com on the home page. The second DC State Fair is being held on Saturday, August 27, from 10 AM to 6 PM. The contests have expanded this year–you can check out all the details by clicking on the links at http://dcstatefair.wordpress.com/2011contests. The deadlines are approaching for the Crafts contests, Baked Goods contests, and Prepared Foods contests. If you're a crafty, culinarily inclined, or canmaster DC resident, submit your entries by midnight on Thursday the 25th to ensure your spot in the competition! Those who enter veggies grown in a DC community garden can win their garden a gift card donated by Behnke's! The Homebrew and Photography contests returned this year, but as last year, judging has already occurred, but the winners will be announced at the Fair. Check out www.dcstatefair.org/event-details for more information about the day! August isn't really my favorite month. By now, I've had enough of summer heat and I'm anxious for autumn. And yet, I know that the respite that autumn holds, of colored leaves, cooler temperatures and visits to the local pumpkin patch will arrive and depart all too quickly, to be replaced by the bitterness of winter. And so, August prods me to go outside. The tricky part is trying to determine what can still be planted in August. Although it may seem far away, the first frost date is lurking out there in the shadows and needs to be taken into consideration for planting any cold sensitive plants, especially anything that produces fruit or vegetables. Of course, no one can predict when the first frost of the season will actually occur. Sources such as the National Climatic Data Center, The Farmers Almanac, and Victory Seeds all list different dates for the average "first killing frost date" for DC. The earliest of which seems to be October 17th.....less than 60 days away. (Although a more accurate date is probably late October or early to mid November). So now that we know that date, we can do a little math to determine what can still be planted. Days to count back from first frost date. 1) First, if you are growing your plants from seeds, you have to determine the average number of days for the seeds to germinate. Most seed packets will contain this information. It can also be found on many seed catalog websites. Here is a list I found on the Heirloom Seeds website. 2) I asked several "garden experts" I know what they thought "average harvest period" meant. To me, it was logical to think it meant the time from when a plant sprouts until when you can expect to start your "harvest". Other people thought it might mean the length of harvest period. 3) According to the University of Virginia Extension website "The Fall Factor takes into account the slower growth that results from cooler weather and shorter days in the fall and amounts to about two weeks." 4) "The Frost Tender Factor is added only for those crops that are sensitive to frost (corn, bean, cucumber, tomato, squash), as these must mature two weeks before frost in order to produce a reasonable harvest." So if you take all of those numbers, add, subtract, carry the one, etc. you can probably determine what you can still plant with the hopes of getting some more luscious home grown food and veggies before old man winter comes along and spoils your plans for fresh, homegrown produce. If you would rather spend your time planting instead of doing math, the folks at Johnny's Selected Seeds were kind enough to let me share their Fall Planting Calculator with you. Just put your cursor in the the square over the When to Plant column, and plug in the date that you think the first killing frost will occur. The worksheet does the rest for you. They've got other great calculators on their website including a seed calculator, a target harvest date calculator, a caterpillar tunnel worksheet, and more. I encourage you to check them out! Emerald Ash Borer Quarantine a Serious Issue - Don't Move that Firewood! If you are like me, you may be on the lookout for future firewood. Fireplace season isn’t that far away, so any piles of lumber from cut down trees look like potential fireplace fodder to me. But because of concern over Emerald Ash Borers (EAB), there is quarantine in effect for many local areas that prohibits the movement of ash trees and wood out of quarantined area, as well as movement of all hardwood firewood. The Emerald Ash Borer is an invasive pest from Asia that feeds on and kills ash trees within three years after infestation. Ash trees are one of the most common and important landscaping trees used in Maryland and are common in western Maryland forests. Ash wood is used for all traditional applications of hardwood from flooring and cabinets to baseball bats. Ash is the most common tree in Baltimore City with approximately 293,000 trees and accounts for about six million trees in Baltimore and surrounding counties. USDA has estimated that losses could exceed $227.5 million in the Baltimore area alone if the emerald ash borer were to become established. * Don’t move firewood – buy it where you burn it. Hauling firewood is the most common way for damaging plant pests to be moved from one area to another. In addition, the state quarantine prohibits anyone from moving hardwood firewood or any other ash tree materials out of the regulated area. * Don’t plant ash trees. As the EAB is expanding its range in Maryland, diversified plantings of alternative tree species are recommended for residential landscaping. For more, extensive information about the Emerald Ash Borer and the serious damage it can cause, visit Stop The Beetle or the USDA website. Where: Central Library Community Garden (east plaza near tennis courts), 1015 N. Quincy St., Arlington Va.
Join Don Weber, USDA-ARS entomologist, to learn how, in the midst of the summer harvest, just a few minutes planting will reward you in September, October, and even November! You can extend your gardening with easy, nutritious fall-harvested crops. Our mild climate allows excellent late-season yields of broccoli, cabbage, bok choi, carrots, lettuce, spinach, and many other vegetables. Back in December, I wrote a post about DIY network’s Blog Cabin Sweepstakes. I love sweepstakes. I enter them all the time. And I’ve actually won WAY more than my share of good things. But that doesn’t mean I’m going to quit trying to win more! Starting Monday, you can enter to win a renovated home on the Chesapeake Bay in Susan, Virginia, about 155 miles southeast of DC. For the past five years, DIY Network has let viewers vote on various options to be included in a home that they build or remodel. At the end of the renovation, viewers can register to win the home. Since this year’s home is on the Chesapeake Bay, when I first heard about the contest, I contacted Lisa Dyer of DIY Network to ask her if they were going to keep the beauty of the Bay in mind by incorporating Bay Friendly Landscaping. No matter where you live in the DC area, your lawn and garden practices can have an impact on the Bay. But properties that are directly on the water, such as this one, have an almost immediate effect. Everything that goes into the ground on this property has the potential of finding its way into the Bay. 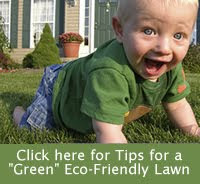 So the use of eco-friendly landscaping is very important. I confirmed that we are indeed incorporating Bay-friendly landscaping choices into our Blog Cabin online voting. That polling period will be from Feb. 28 – March 13. While we don’t have specifics on what exact questions will be asked at this time, we will have confirmation around early to mid-February at the latest, so I will follow up with you then to provide the specifics. Well, I forgot to pay attention to their website in Feb and March (and Ms Dyer forgot to follow up with me) so I don’t really know if they asked viewers about whether they should use Bay-friendly landscaping. But it looks like they are done with their landscaping now, so let’s see how they did. The before photo (above) shows a huge expanse of lawn, and not much else. Not necessarily bad for the Bay, if you don’t use a lot of chemicals to keep it green or over-water it. But the after photos look much better. Expect to see hollies, magnolias, petunias, grasses and long-blooming hydrangeas. Shrubs, trees and flowering plants were chosen for their drought tolerance, hardiness and color. You be the judge? How did they do? If you won this house, would you keep these plantings or add new ones? When I first saw this public service campaign, I honestly didn't know what to say about it. I mean, other than it's really, really weird. WaterSense, a partnership program sponsored by the U.S. Environmental Protection Agency, has teamed up with Lowe's, Kohler, Bosch and P&G to remind people not to waste water. Their new campaign is called Wasting Water is Weird and it's already running online. It will soon launch on television as well. It’s an important message delivered by a guy named Rip the Drip, who shows up in people's homes to remind them that, well, wasting water is weird. At first, I thought that it was a little TOO weird. Kind of creepy, even. But I guess that's the point. It will definitely stick in people's minds. The campaign is so weird, that it really might help remind people not to waste water. And it will certainly give the guy who plays Rip the Drip something interesting to list on his resume. City Blossoms is seeking energetic, creative, garden-loving individuals to promote access to interactive, holistically healthy green spaces for all urban citizens. City Blossoms' programming includes regular weekly workshops at several locations in Washington, D.C., and Takoma Park, as well as family-oriented weekend events, volunteer days and various community celebrations. City Blossoms would like to hire three interns in the areas of administrative support, communications & outreach, and instruction. Must be available to work weekdays and Saturdays. Internship includes hands-on experience in community building through dynamic, multi-purpose green spaces. Money Doesn't Grow on Trees - Or Does It? Sure the economy concerns me, but probably not as much as it concern others. Why? Because I know that money loves me. Money doesn’t just love me. It is obsessed with me. Money stalks me. It sits up at night trying to find ways to catch my eye and come home with me. Okay. I know those statements are a little extreme, but I’ve read a lot of books about the secret to using positive affirmations to get what you want, and those are the ones that I have made up to help attract money. I also collect 4-leaf clovers and acorns and other items that are supposed to attract prosperity and even painted one room in my house money green, using the color matching machine at the hardware store and a hundred dollar bill. Oh yeah. And I’ve been saving money since I was 14 and I’m as frugal as a packrat. Alfalfa – Known traditionally as the “good luck” herb. Allspice –It is thought to attract business luck or success. Basil – Soaking basil leaves in water for three days and then sprinkling the water at your business premises is thought to attract financial success. Bay Leaves – Bay leaves increase intuition and are good if you are looking for a promotion or a job. Tuck some under your mattress or boil them and sprinkle the water around your home. Citronella: The leaves are thought to be good for attracting business. Water is the main element that brings wealth to your home. Water should always be clear, moving and free flowing. Never let your water get stagnant. A fish tank is one way to stimulate your wealth areas. Make sure fish are healthy and strong and always keep the tank clean. A fountain is also a great way to keep your abundance flowing. Enhance your wealth corners by hanging wind chimes, a mobile, or by hanging Chinese coins tied together with a red ribbon (if you do this make sure you use coins in the increments of 3, 6, or 8 with 8 being the most powerful money manifesting number). Add some plants with round leaves to your home. This is another good way to enhance your wealth area, according to feng shui guidelines. If the plants have red or purple flowers that is even better. Paint for prosperity. The best colors for the wealth area are green, red, purple, black and gold, with the most effective colors being red and green. Make sure your plumbing is in good working order. A dripping faucet is symbolically and literally money going down the drain. You should also keep your drains plugged when not in use. This keeps money in your possession. You do not want to accumulate wealth then have it go down the drain. Close toilet lids. You don’t want to flush your money down the toilet. Incorporate feng shui elements outside your home, in your yard, to attract wealth and prosperity. A fountain can be placed in front of your home; the water should flow inward towards your home. Place a windmill, weathervane, or any moving, spinning object in the far left corner of your backyard to stimulate energy and attract wealth. Now if you don’t believe in any of that hooey, you can always go bury some of your money in the backyard until things in the stock market decide to settle down again. Wednesday, August 3, 7 p.m. Cooking straight from the garden. We’ll see, smell and taste some of the great vegetables and herbs of summer with Puwen Lee of AFAC and the Library gardeners! Come see how to grow, harvest, and use tomatoes, tomatillos, eggplants, cucumbers, summer squash, basil, and other plants of the summer garden. It doesn’t get any fresher than straight from the garden! I'm such a nature lover that is a tough moral dilemma for me sometimes when it comes to trying to deter wildlife from my gardens. But no matter how much you love the thought of waking up and spotting a few deer slowly making their way across your property, once they start eating your plants, that love can quickly turn to loathing. Kathy Jentz, editor and publisher of Washington Gardener Magazine, recently polled her readers and asked them what some of their favorite deer-resistent plants are. She received quite a few responses, and I image the list will keep growing as other local gardeners add their comments. If you want to add to the list, or read the suggestions of others, visit Kathy's blog post: Favorite Deer Resistent Plants. The perfect hair "do" for your garden? I’m not very squeamish when it comes to adding things to my garden for nutrients. Rotten fruit, critter poop, dead hornworms and huge baseball size balls of lint that I pull out of my dryer, all look like possible fertilizer, to me. But I have to say that when I first heard about SmartGrow products, the idea kind of creeped me out. SmartGrow is an all-natural organic plant-growth supplement. Our organic plant growth mats are an economical way to achieve lush, healthy plant growth. Your plants will grow thicker more robust roots and stems, have healthier greener leaves, and more and longer lasting buds. All this while reducing watering time, the need for fertilizer, and helping to prevent weeds. SmartGrow makes it easy to grow strong, healthy plants organically. SmartGrow promotes enhanced root growth, replaces herbicides and the amount of traditional fertilizers - saving you time and money. The creep-out factor got a little stronger after I watched their videos and saw the photos of warehouses full of hair just waiting to be turned into garden nutrients. But creep-out factor aside, I guess the big question is, how well does it work? Although there are some testimonials on the website from various farmers and gardeners, I couldn’t find any actual research to back up the claims for either weed prevention or fertilizer potential. There is a vague document pertaining to some research done by the University of Georgia on the water retention capabilities of the product. It wasn’t clear to me what the research was proving so I’ll have to go by my own research on that one. My own hair doesn’t really retain water for very long, especially if I am out in the sun. A light bulb did go off in my head when I was thinking about another possible benefit of using human hair in the garden, but it was quickly turned off. Human hair has long been touted as a home-solution for keeping deer away. The Maryland Department of Natural Resources and the U. S. National Arboretum both list human hair as a possible deterrent for deer. So placing woven-hair mats around our plants might seem like the perfect solution. I didn’t receive any reply in my attempts to contact the manufacturers of SmartGrow products and could not find any research online about the possible deer deterring benefits. But a little further reading led me to believe that it probably wouldn’t work for that problem. Deer deterrents usually work in two ways, either by smell or taste. Human hair is thought to deter deer by the smell. So the thing that takes much of the yuck factor out of the thought of using human hair in the garden – a 120 degree bath – also probably takes away any remaining smell. In any case, I think I might try one of their hairmats, at least in some of my potted plants. They certainly can't be as gross as my homemade hornworm plant supplements. The Prince William Wildflower Society Chapter of the VNPS invites you to the 2011 Annual Meeting of the Virginia Native Plant Society. Following on the heels of the Civil War Sesquicentennial commemorations of the First Battle of Manassas, members will gather to explore the varied flora and fauna in Virginia’s only county that spans three geological provinces, from Bull Run Mountain to the coastal plain on the Potomac River. The Prince William area is historically rich and provides an exciting backdrop for hiking, canoeing, exploring the urban and rural wilds, hearing exciting speakers, and visiting with old and new friends. Click here for a Schedule of Events and Hotel accommodations and rates.